Perfectly timed for The A.V. Club’s ongoing Simpsons Week, The Simpsons has continued to be a functioning television show, as evidenced by its production of new episodes. But according to executive producer Al Jean, one of those recent episodes, January 4’s “The Man Who Came To Be Dinner,” almost wasn’t an episode at all. Rather, as he revealed with a New Year’s Eve tweet, it was once “seriously considered” as a plot for the sequel to The Simpsons Movie that Fox has long asked for but producers have mostly shrugged off, leaving that burden for future, far-off generations of Simpsons producers. Now Jean has expanded on that for Entertainment Weekly, saying “The Man Who Came To Be Dinner” actually has a long history of almost being something else, including almost being the original finale for season 24 back in 2013. At the time, Jean says, it was held because he and James L. Brooks thought the story of the Simpson family being abducted by Kang and Kodos and placed into captivity on Rigel 7 had real potential as a movie, what with the “new rules” that would be allowed by an alien planet and the “cinematic nature of space,” the most photogenic side of the universe. 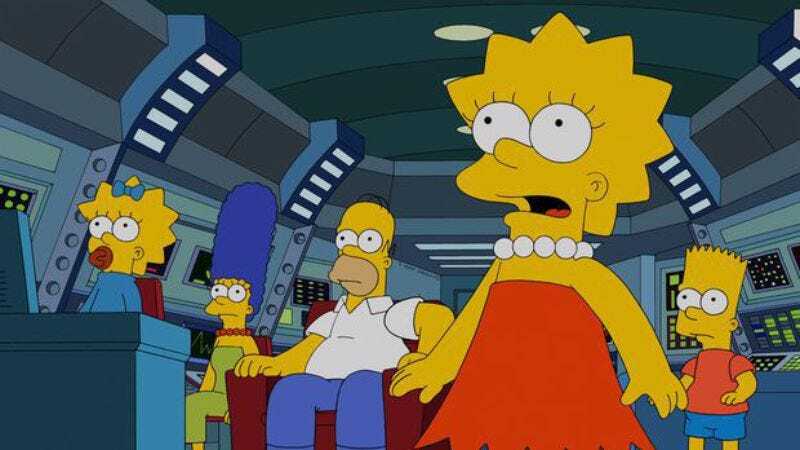 However, then Jean and Brooks remembered that Simpsons fans hate “new rules,” and that the whole idea of alien abduction taking place outside of a Halloween special—then being waved away by a memory wipe—would probably prove widely controversial if that were the Simpsons Movie sequel. So they decided to do it anyway—but on TV, where that doesn’t matter, apparently. “We were worried that people might think it’s an idea that’s not canonical—it doesn’t really happen, unlike all of other 560 episodes that really ‘happened’” Jean says. In fact, so worried were they that people would think “Man Who Came To Be Dinner” doesn’t fit in with the rest of the episodes, they just made it an episode, thereby limiting any debates over how it destroys Simpsons “canon” to just the viewing audience that still has such things. And so, in the end, it is like it never happened.